PlanetWheelShortcuts, shorted as PWS, is an incredible tool for shortcuts input, for example the operating system shortcuts or programs shortcuts, in the fastest way possible. It saves your effort in remembering numerous shortcuts of various commands. PWS enables you to simulate almost all shortcuts input via mouse moving, including single, multiple, and repeating shortcuts input. PWS enables you to manage (add, delete or edit) the planets pretty easily. PWS enables you to manage (add, delete or edit) the wheels pretty easily. 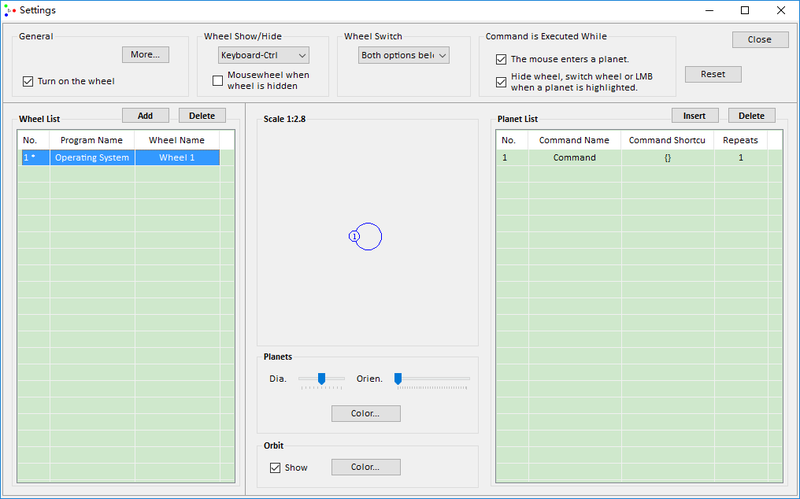 PWS enables you to set ways to show/hide the wheel, switch the wheel, or execute the command pretty easily.